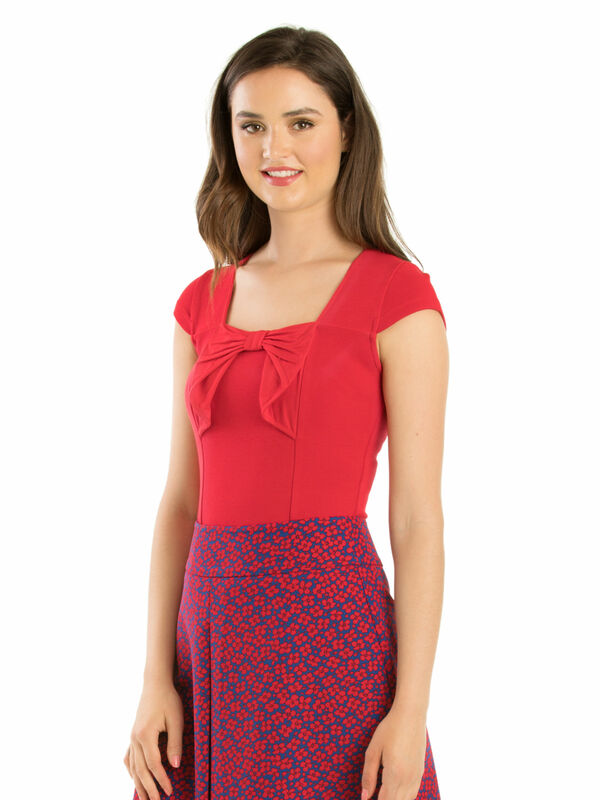 Livia Top https://www.review-australia.com/au/livia-top-red/RE19TK059.RERED001.html Bold yet stylish, the Livia Top will take you from office days to night occasions. Crafted from a stretchy, ribbed material for a fitted finish and adorned with a large bow tie at the chest. 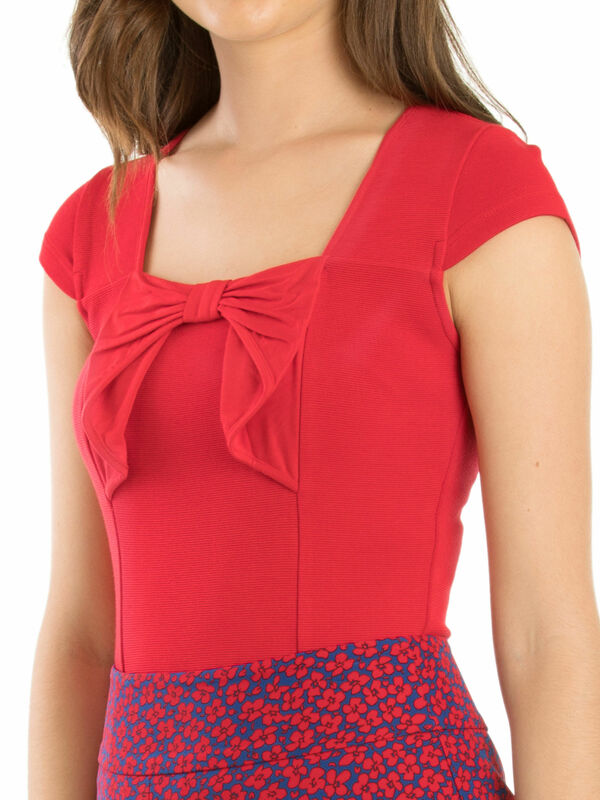 It has a square shaped neckline and cap sleeves for a modern look. Style with a pair of high waisted pants or a pencil skirt depending on the occasion. Livia Top is rated 4.9 out of 5 by 35. Rated 5 out of 5 by Deanna from Cute knit top I finally found this top after searching for it. It goes with a few of my Review skirts. Rated 4 out of 5 by Clementine from Red Livia Top Bought it on sale and it looks great. Love the color and fabric. Rated 5 out of 5 by Kariony from Classic red! 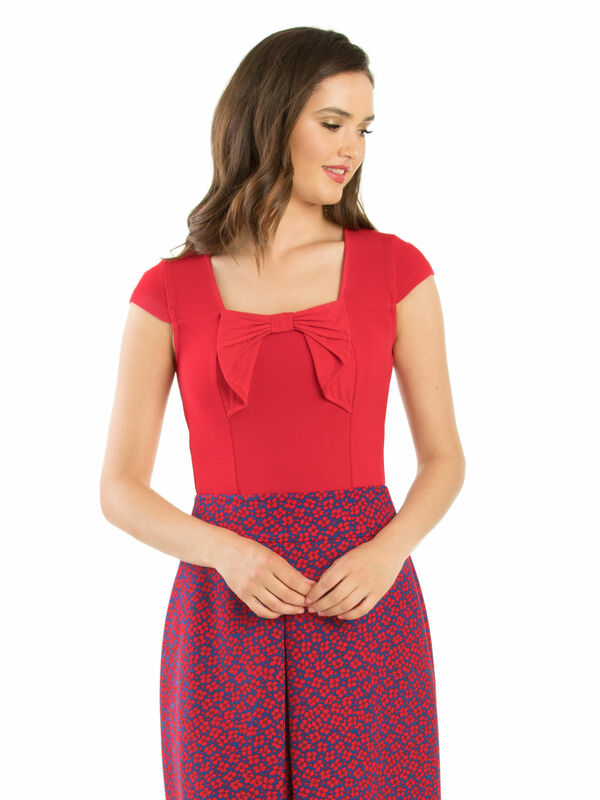 I was already a fan of the Marcellina top so was excited to see a similar version in red. The fabric on this one is heavier than Marcellina but the same as far as sizing goes. This is definitely a style that won't go out of fashion and will remain a staple in your wardrobe for years to come. Great price too! Rated 5 out of 5 by vivstar from Cute and Elegant top I bought this top about a month ago whilst looking to spend a gift voucher from Review and was lucky enough to find this top also had a 25% discount applied. Definitely a win all round... I love the colour and cuteness factor and definitely felt lucky to have stumbled across this top in store. Rated 5 out of 5 by Review Addict 91 from A new classic! I already had the blue very similar version of this top, which I love, and so I had to have this! The main part is a ribbed fabric, and so is thicker. It holds its shape well, is very flattering on the bust (especially for us less than well endowed ladies!) And tucks in fabulously! Rated 5 out of 5 by jamiejenna from Loving the Bow I'm so pleased I purchased this top online at a great price - it is very flattering and comfortable too. Great wardrobe staple that can be worn with a variety of skirts, pants, & culottes. Bow feature elevates it from 'ordinary' to something special.